Home » cricket news » Here is what happened when Virat tried to touch Sachin Tendulkar's feet to complete a tradition! Here is what happened when Virat tried to touch Sachin Tendulkar's feet to complete a tradition! 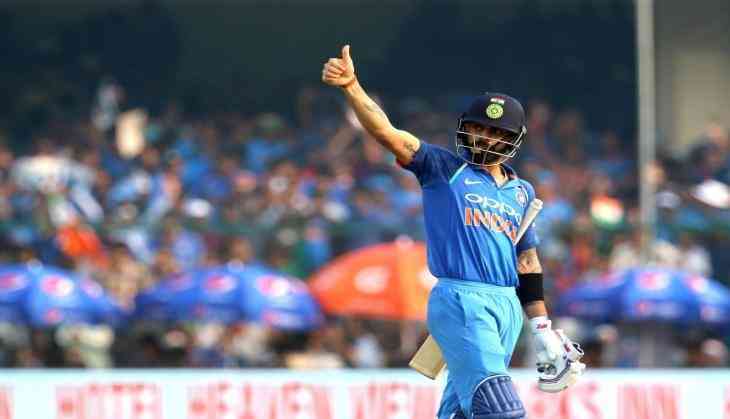 The 'run machine' of Indian cricket Virat Kohli is arguably considered one of the best batsman in the history of cricket. The cricketer will turn 29 tomorrow. Kohli was born on 5 November 1988. While talking to Gaurav Kapoor, in the breakfast with champions, the Indian skipper Virat Kohli shared a story in which he described an incident, that how his admiration for the god of cricket Sachin Tendulkar had gotten many pranks played upon him by Yuvraj Singh, Munaf Patel, Harbhajan Singh and Irfan Pathan. While talking about his first meeting with his idol in the dressing room with Sachin, the Indian skipper said, "After getting selected, the initial two days the only thing I could think about is meeting Sachin in the dressing room in any way possible. And these people got wind of it because I had told that to someone." The list of the primary prankster, who use to play the prank upon Virat includes Yuvraj Singh, Munaf Patel, Harbhajan Singh. They even convinced Virat that he needs to touch Sachin's feet because it is a tradition for a newbie. Virat took this to heart and when he met his idol Sachin for the first time in the locker-room, he completed the tradition. With Virat's gesture Sachin was shocked and when he asked what is going on, he gets to realise that he was the prank by Yuvraj Singh, Munaf Patel and Harbhajan Singh. While talking about his comparison with Sachin he said, "There's no question of being compared to him. Because of everything he has given us, he doesn't deserve to be compared with anyone. Not at least in the current generation."